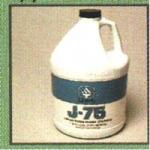 Use before applying J-73 to clean and sanitize floor. Cleanroom floor cleanser and stripper. Use before applying J-73 to clean and sanitize floor. Features » Cleanroom floor cleanser and stripper.